Welcome to my online resource page. If you have any questions about what you see here, please call 660-646-8000, Opt. 7. 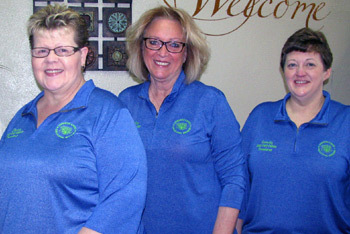 Visit my office at 700 Webster Street, Suite 5, Chillicothe, Missouri. My FAX number is 660-646-8015. Paula McCoy, Collector-Treasurer, was sworn into office March 31, 2017, for the new term of April 2017 to April 2021. Sherry Parks, County Clerk, swore the Treasurer into office while granddaughter, Mahlia, held the Bible. 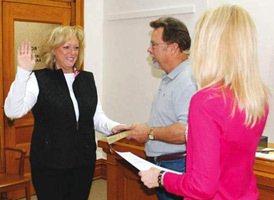 CAPTION: Paula McCoy (left) took the oath of office for the position of Livingston County Collector-Treasurer on Thursday, April 3, 2014, as administered by County Clerk Sherry Parks, while her husband, Pat, held the Bible. Missouri Gov. Jay Nixon appointed McCoy to the position on Tuesday, April 1, 2014, following the retirement/resignation of Martha Peery. Peery's last day in office was Monday, March 31, 2014. McCoy, a Democrat, was the chief deputy collector-treasurer for Livingston County and held the position since April 2006. A native of Chillicothe, she previously owned a small business in the community and also co-managed the cafeteria at Bishop Hogan Memorial School for several years. The Collector-Treasurer's office is located on the first floor of the historic Livingston County Courthouse in the SE corner. Extended office hours during heavy collection months of November and December: 8:30 a.m. until 4:30 p.m.
A steady stream of people filed into the collector's office at the Livingston County Courthouse Wednesday to pay 2017 property taxes. Taxes must be paid by Dec. 31 in order to avoid penalty. Since Dec. 31 falls on a Sunday, the last day to pay taxes in person and without penalty at the collector's office is Friday. Taxpayers may put their tax payments in the drop box on the east side of the courthouse as late as December 31 to avoid penalty. They also may pay online at www.livingstonmo.devnetwedge.com. A convenience fee will be charged for taxpayers choosing to pay by credit card or debit card. An 11 percent penalty will be assessed if taxes are paid after the Dec. 31 deadline. The customer service window at the U.S. Post Office in Chillicothe is open until noon on Saturday. Traffic has been brisk throughout December at the collector's office, and collections have exceeded $6.7 million as of Wednesday, according to Paula McCoy, Livingston County collector-treasurer. Livingston County employees recognized for milestone years of service in 2016 were from left, Ken Lauhoff (20), Mark Shockey (5), Chris Mueller (5), Karen Hinton (5), Paula McCoy (10), Linda Gilliland (25). Not Pictured: Brenda Estabrook (25), Amy Hobbs (5), Hilary Rasmussen (20), James P. Valbracht (10), Eric Menconi (5), and Westley Seifert (5). On February 3, 2015, Livingston County Collector-Treasurer Paula McCoy announced that the county's online property inquiry website now is accessible to the general pubic. The implementation of DEVNET’s wEdge e-government solution improves Livingston County's customer service by fully integrating with the county's existing Edge solution for property tax assessment administration and billing, and collection solutions. The web application for providing property tax and appraisal information to users provides an easy-to-use interface for searching and viewing all personal properties and personal property accounts within Livingston County. With minimal effort, users can create queries, browse matching properties, and view details about each property. Residents of Livingston County and the public can now view tax information online and, hopefully, in the near future, be able to make online payments. The public can now print off paid tax receipts that the license bureau will accept as paid receipts. There is no subscription fee for the use of the new Livingston County Online Property Inquiry site, which is available at http://livingstonmo.devnetwedge.com. For more information, contact Paula McCoy at 660-646-8000, option 7. June 30, 2016 - County Taxes May Now be Paid Online - Livingston County Collector-Treasurer Paula McCoy has announced that county taxpayers can now make tax payments online through the DEVNET wEdge e-government solution website. Livingston County's wEdge application has been providing the public with access to tax information since February 2015. DEVNET's wEdge solutions provide web access to the Edge Ecosystem. wEdge is an e-government and property search platform that integrates property information, GIS, and other government services through a single application, including online payment of real estate or personal property tax bills. wEdge is a customizable inquiry solution that integrates the Edge applications to give county and public users access to important taxpayer information and contains numerous administrative and security settings. McCoy noted that tax payments are due on December 31 of the tax year. After the December 31 deadline, interest and penalties will be applied. There is no subscription fee to the taxpayers of Livingston County or the general public for the use of the wEdge website. The Livingston County Collector-Treasurer's office is located in the Livingston County Courthouse, 700 Webster Street, Suite 5, in Chillicothe. The office can be reached by phone: 660-646-8000, ext. 7, or fax: 660-646-8015. Office hours from 8:30 a.m. until 4:30 p.m. Monday through Friday Livingston County DEVNET wEdge Online Property Tax website is http://livingstonmo.devnetwedge.com. 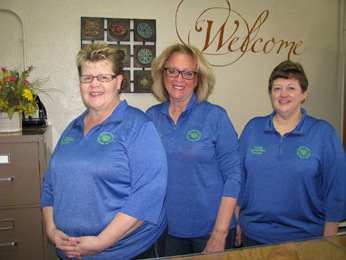 Thank you for visiting... please contact us if you have any questions about the Treasurer's office!